This simple Halloween treat gives a whole new meaning to “frost on the pumpkin”. The idea came to me when I was writing The Children’s Party Handbank. As a kid, I used to carve oranges like Halloween pumpkins long before the holiday showed up on the calendar. It was a more important party to me than my birthday. I guess I was just ahead of my time to start thinking about Halloween in August! These days I see costume pop up stores long before school starts. 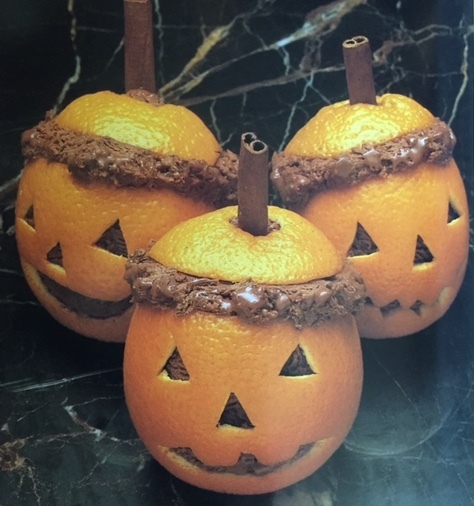 So all you really need for this devilish dessert is a good paring knife, a grapefruit spoon, large oranges, whole cinnamon sticks and chocolate ice cream or gelato. Figure on using about 4oz of ice cream per orange and calculate the amount you’ll need from there. A pint will fill about for or five oranges (enough for the family) but you’ll want a half gallon to a gallon for a bigger soiree . Slice the tops off of oranges and completely scoop out the fruit with the graperuit spoon. (Note: I save the orange leftovers for fruit compotes, if using seedless oranges.) Carve simple Jack O’Lantern faces into each orange shell. Cut a hole in the top of lids. 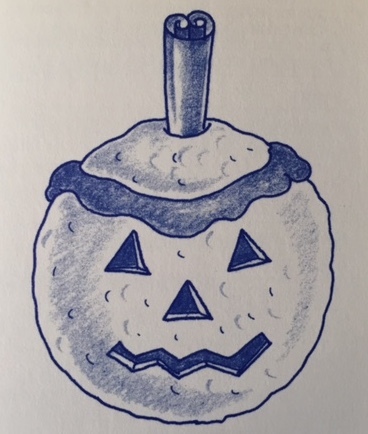 Working quickly, fill pumpkins with ice cream and top with lids. Insert cinnamon sticks through lids. Wrap individual oranges in plastic wrap and freeze until right before serving.